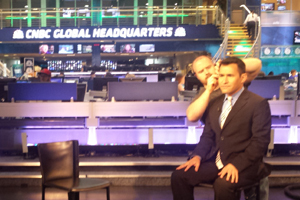 I went back on CNBC for my third appearance this afternoon on “Power Lunch” with Tyler Mathisen, the co-anchor. This segment was based on the recent research study I worked on with Beyond.com called the “Multi-generational Job Search“. It was our second year fielding the study and this time is was far more interesting an extensive because we interviewed companies, not just job seekers. CNBC was interested in covering this because over a million new college students have recently graduated and are unemployed. Hopefully this segment will help equip them for the job market and point college freshman, sophomores and juniors in the right direction. Companies aren’t hiring liberal arts majors. Only 2% of companies surveyed are hiring liberal arts majors versus 27% for engineering and computer information systems and 18% for business. 49% of all generations responded that they believe there are “no jobs” out there for those with a liberal arts degree. This is a reality check to student (and their parents) who need to take courses and majors that align to open job opportunities or suffer. Companies are hiring for cultural fit over all other qualifications. 43% of companies say that “cultural fit” was the single most important determining factor when making a new hire. Only 2% ranked “GPA” as being most important in the recruiting process. Students need to align their personality with the right corporate culture if they want to get hired. They need to stop stressing out about things like GPA that don’t carry much weight anymore. Companies complain that students are unprepared for job interviews. 36% of respondents said they are unprepared, and 33% said they have a bad attitude when interviewing. Having a positive attitude was the most important thing that employers looked for when hiring. The expectations that students are doing research on the person they are going to be interviewing on LinkedIn, on Google News for company information and on the company website are higher than ever before so students need to put the effort in. Apply for the right positions at the right companies so you naturally have a positive attitude. Bring case studies and a work portfolio to eliminate the perceived risk of hiring you. Take additional classes, online courses and read books in order to fill knowledge gaps. Network as much as possible because employee referrals are given high priority. Do a lot of prep work before interviews to show interest in the people interviewing you and the company.